And another easy recipe for a vegetarian Thanksgiving to end the week! 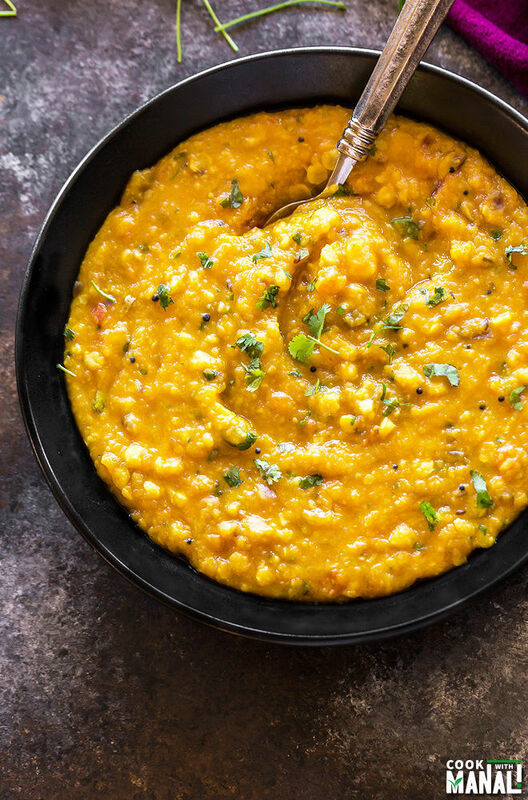 This Butternut Squash Dal combines lentils with onion, tomato and is lightly tempered with mustard, cumin and curry leaves. 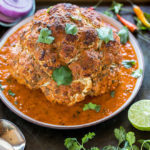 Serve it with naan or rice! Vegan and gluten-free. I have noticed that you guys really like dal recipes on the blog, like this Spinach Dal is quite popular on Pinterest. 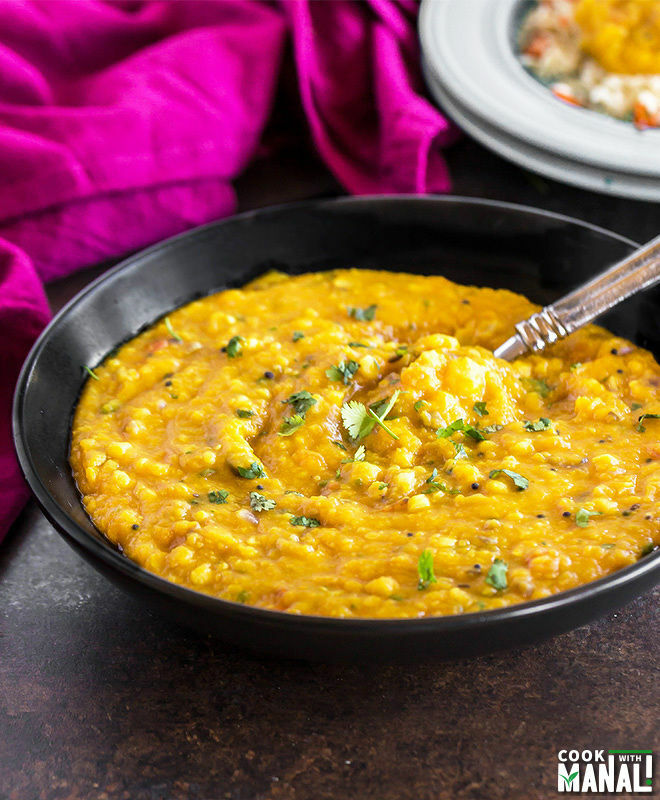 And so I thought I should share some more dal recipe here and since Thanksgiving is so close, it only made sense to share this Butternut Squash Dal. Honestly speaking, my list of dal recipes is pretty long. I mean I am an Indian, who grew up eating dal 365 days in the year (no exceptions!!) so of course I make them all the time. I will definitely share more in the coming months. So for this butternut squash dal, I combined two lentils – chana dal and toor/arhar dal. Chana dal is little on the heavier side and it wasn’t made very often at my home but toor dal – that was everyday. Urgh, I never used to like it. Why would any kid like something which is served everyday for lunch? Until and unless it’s a cake of course! Anyway so for this butternut squash dal I used both and it really worked very well in the recipe. You can obviously use only chana or only toor depending on what you have in your pantry. I don’t really add a lot of spices in my dal recipes because that way you really get the dal flavor and you don’t want spice overpowering that. So here it’s just little tempering with cumin seeds, mustard seeds, ginger and curry leaves. I pressure cooked the butternut squash along with the dal and the squash almost dissolved into the dal. In fact that way the squash flavor was so much more pronounced. If you want to bite into the squash pieces, you may pressure cook them for a lesser amount of time or you can also roast them. The squash gave a little sweet flavor to the dal which I really enjoyed. As you can see from the pictures, I kept the consistency on thicker side, you can adjust this as per your preference. 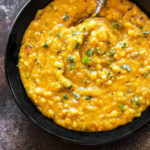 This butternut squash dal is easy to put together, is healthy, delicious and perfect for the season. I hope you guys give this a try! * Soak the chana and toor dal for 20-30 minutes. Drain water and set aside. To a pressure cook add, the soaked dal with turmeric powder, salt, chopped ginger and butternut squash. Pressure cook till dal is nicely cooked and squash is completely softened. I cooked on high heat for 4 whistles and then set the heat to low and cook for additional 5-6 minutes. Let the pressure come off on it’s own and then set the dal aside. In a pan or work, heat oil on medium heat. Once the oil is hot, add cumin seeds and mustard seeds and let them crackle. Once the seds pop, add chopped onion, green chili and curry leaves. Saute for 2 minutes or till onion becomes slightly translucent. Add chopped garlic and saute for a minute or two. Now add chopped tomatoes and mix. Also add salt. Cook the tomatoes for 5 minutes or till they soften up. Now transfer the cooked dal to pan , add water and mix everything. Adjust salt at this point. Lower the heat and let the dal simmer for 5 minutes. Add cilantro and lemon juice (if using) and serve immediately. 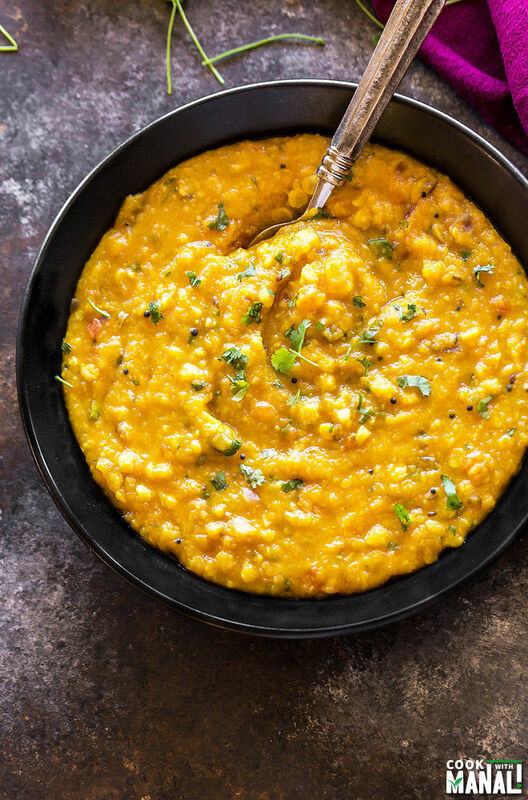 You can serve this butternut squash dal with rice or any bread of your choice. I served mine with some pulao. * You can use ghee or butter in place of oil for the tadka/tempering. 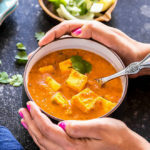 Stick to the oil to keep it vegan, the dal tastes great anyway! * The prep time includes the soaking time of the chana and toor dal. * Add more water for a thin consistency dal. 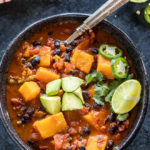 Vegan & gluten-free Butternut Squash Dal. Lentils cooked with onion, tomatoes, butternut squash and lightly tempered with cumin and mustard seeds. Soak the chana and toor dal for 20-30 minutes. Drain water and set aside. Pressure cook till dal is nicely cooked and squash is completely softened. I cooked on high heat for 4 whistles and then set the heat to low and cook for additional 5-6 minutes. Let the pressure come off on it's own and then set the dal aside. Healthy protein and carbs…and not to mention it’s delicious and comforting..exactly the food I love! Oh such a pretty dish, Manali! I love the color! And the onions and tomatoes in here too…so perfect for Thanksgiving! I know right? 🙂 Thanks Gayle! Yes it’s great with paratha! Thanks Puja! Lovely looking delicious and healthy dal, Manali. 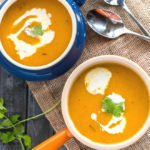 Love that you combined butternut squash with chana dal. YUM. it goes so well together! Thanks Anu! 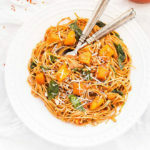 Love that you made a butternut squash version! The color is gorgeous and so perfect for fall! Look at this beautiful dish — it’s so rustic and I love the color! 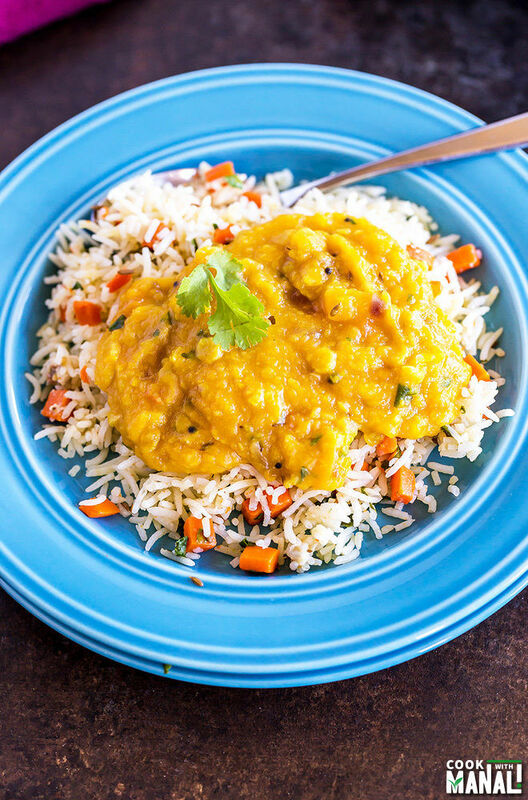 You did an amazing job with this twist on Dal! Love eveything about this dish! Great flavors and the pictures are beautiful! 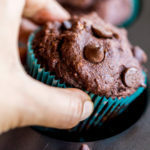 Hi Manali, this is Fran from G’day Souffle.’ I saw your recipe photo on Foodgawker. I’d like to expand my Indian cooking recipes so I’m going to give this dal recipe a try! Wonderful! I can’t believe that I can finally cook Indian meals right in my own kitchen, thanks to your delicious recipes and easy-to-follow directions. My husband is so happy (he is Goan and I am American). Thanks again, Manali! 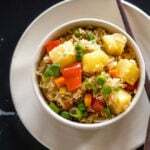 How long cook this in Instant Pot? I do not have stove top pressure cooker. Looks very nice and tasty! 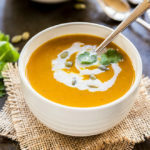 I would skip the chana dal if making in the IP if you want to keep the butternut squash pieces intact (because chana dal takes more time to cook and the suqash pieces would dissolve by then). If you don’t care about them dissolving them in the dal then use the same recipe and cook for 10 minutes on high pressure. If you want the squash pieces intact, use arhar/toor/split pigeon peas lentil only and cook for 5 or 6 minutes on high pressure. Hope this helps Jay! Fab! Thanks for reply. I will do 5 or 6 minutes high pressure with toor dal only. So yummy! Especially when it’s just done. Was great the next day as well, but I preferred it right off the stove. Speaking of which, I don’t have a pressure cooker, so I have pre-baked the squash first, and then cooked that and everything else in a regular pan. Thank you for the recipe! My husband who’s always been a vegetarian loved it, and we’ll put this in our meal rotation.